Located in Central Park, directly behind Central Library, at Goldenwest Street and Talbert Avenue. The Amphitheater is located east of Goldenwest Street, north of the Central Library in Huntington Central Park. 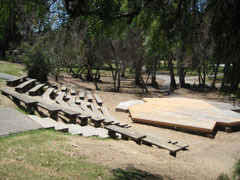 The amphitheater includes a stage and wooden benches and seats 200.